Chesko Mdeka is a married father of six children. Prior to 2003 Chesko earned his living harvesting and hand-sawing timber, and farming maize. Since working with EnterpriseWorks/VITA’s Tree Crop Project in Tanzania, and its predecessor (PRIME), Chesko has established a successful fruit orchard, and a fruit tree nursery in which he produces and sells improved varieties of high-value fruit seedlings including apple, avocado, peach, pear and plum. In a region of Tanzania where the average income for smallholder farmers is less than $300 per year, Chesko’s fruit tree nursery alone has generated a profit of approximately $900 over the first three years of operation. Chesko has used this profit to finance the construction cost of his family’s new home. 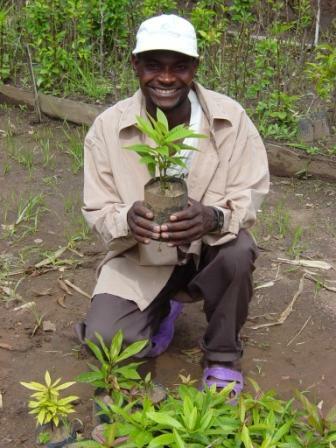 In 2007, and looking further into the future, Chesko expects the income generated through his orchard and nursery businesses to surpass $700 per year, as the trees in his orchard continue to mature and production increases, and as the sale of seedlings from his nursery continue to grow. The USAID funded Tree Crop Project is indicative of EWV’s efforts to promote market-oriented agriculture that is environmentally sustainable. A collaboration with Associates in Rural Development (ARD), the Tree Crops program implemented by EWV has supported adaptive research that helps farmers identify improved fruit varieties that are well suited to the agro-climatic conditions of Tanzania’s Southern Highlands. The project also trains farmers in nursery and orchard establishment, propagation, grafting and budding, pruning, post-harvest handling, grading, sorting, packaging and marketing. Prior to receiving support from the project smallholder farmers in the region typically planted some fruit trees on their farms. However these fruit trees were not actively cared for, production was typically very low, as was the quality of the resulting fruit, which was sold to local buyers at very low prices. With the support of the project farmers now grow improved varieties of fruit, apply a wide range of improved agricultural practices that increase both production and the quality of the fruit produced, and farmer producer groups market their fruit collectively to larger urban markets. The result has been not only a significant increase in incomes, but also the development of a group of rural smallholder farmers that are increasingly able to interact effectively with the marketplace. In addition, expanded investments in tree crops are allowing farmers and communities to generate income in a manner that helps to stabilize fragile hillsides.